We all have the power of seeing but do we actually perceive what we see? Do we take the time to ponder details of items and actions that are around us and consider them? Or do we just pass over them with a quick glance and move on? 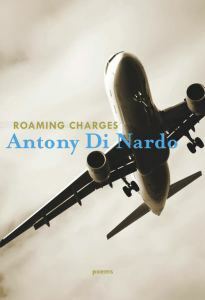 Antony Di Nardo has a keen sense of consideration and his collection of poetry called Roaming Charges brings that skill out for all to see. clouds we made today, the sunset scribbled in as an afterthought. other until both sound so much alike I sing along. Di Nardo has a way of packing a lot of thought in his simple phrases here. The mind’s eye grasps the image he sends out and it is enlightened by the concept he brings forward. This is one of those works that one needs to do in a quiet area and carefully admire Di Nardo’s pronouncements . To stay frightens me as much as leaving does. By the time I found out the evening and morning stars were just about the same, Venus was already a planet. You live, you die, you bake an apple pie. You love the symphony for its jazz. Dogs are frightful beats. Like dragons, they lunge and catch your breath. Mudgett Road is peppered with them. At Maria’s gate the linden trees made lemonade for the sun. The little Frost that I remember, woodpiles, moon pies, tell a story I knew as a child, stacks of small perfections. Rearrangements. Putting together a CV. The house, to flex a muscle, puts all birds on a budget. The mourning dove as raptor. Ségolène is a French woman’s name. Érablière is an arrow off the sign . Ashrafiyeh is the little mountain where someone lives. The three principles of rock paper scissors, all you need to win or lose. And it’s a spin of limbs, that boy chasing a ball across the road. As great and green a meadow, God’s great green handkerchief, was said of Central Park. I see best when I look over mountaintops. Silos for the farmer’s tillage, black-and-white meadow cows. I’m almost there. I gather feathers. I move on. I gather more. A single sock represents another life on earth. The road begins to climb. Di Nardo is very lyrical here. His words flow easily off the page and a reader can feel with great ease the phrases he creates. through both our eyes. Coincidence? by the very same artist. Antony Di Nardo shares his profound thoughts in his collection called Roaming Charges. His work is enlightening and a pleasure to read.